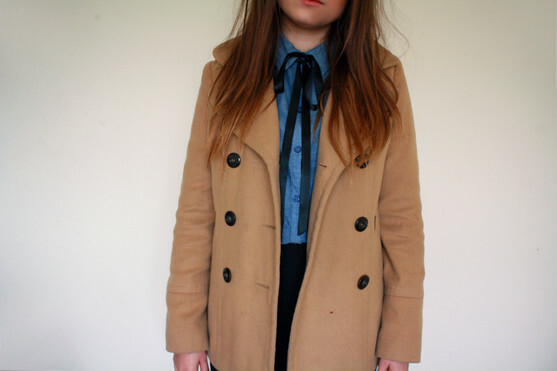 I have to admit this isnt my normal style, I DIDNT like buttoned up shirts, as I THOUGHT they didnt really suit me. I proved myself wrong and on a whim tried this shirt on and instantly knew it was to be! I think it was misprinted in H&M as I paid £7.99, even though it said 12.99 on the label. I've opened myself up to a whole new world of shirts! I like it both tucked in and untucked, I'll probably be wearing it both ways to be honest! I'm totally in love with the little bow I made for it too, I cant remember exactly who's blog I saw wearing a little necktie that they'd made themselves simply using some ribbon! 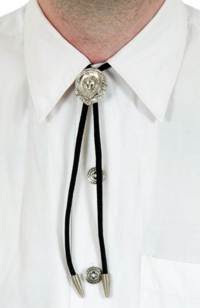 It kinda reminds me of those neckties cowboys wear! Love it! Glad you all liked my November favorites this month! When I was making it, It really inspired me to actually get some of items I've wanted/been thinking about getting recently. Number one on that list is definately a leopard print faux fur coat. The New Look one that I've been looking longingly at in my store for weeks now has just been reduced by a tenner, So I may just have to get it! I tried the 10 on and I think I'd need a 12 to accommodate extra winter layers, The 12's sold out online but the sale is in store too! I worked late night last night, which seems to have done me the world of good, I managed to sleep last night without taking sleep aids! I also woke up without feeling tired for the first time in ages! Lets hope my sleeping pattern will be returning to normal! Been writing and researching for my dissertation today, and will probably keep doing it for the rest of the night, I seem to be on a roll! I did take a small break to watch this week's Glee and Im hoping to watch Gossip Girl later too! I did plan to take todays photos outside (SHOCK HORRORZ), but it hasn't stopped snowing, and I cant bring myself to take my camera (Canon 1000d) outside for it to get wet! I really love this look, I'm wary of wearing buttoned up shirts too but I love what you've done with the bow, so cute! The blue and the camel look great together! Glad to hear the sleeping is getting better, i need to sort mine out big time. Also well done for the dis, i wish i could get motivated! You definitely suit the blouse! Lily I love this! 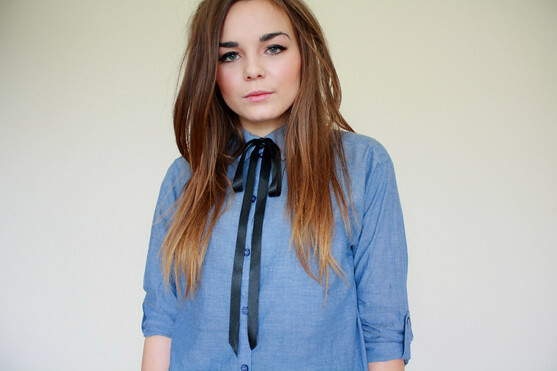 I made a little tie like this too, it totally revamps any shirt! I love that colour too,especially against the camel. Really beautiful outfit post, i love love love! You should have a hot toddy...that will send u right off to sleep (a nip of whisky,boiling water and cloves) at the risk of sounding like an old man it totally works! Love this new look, looks so cute with the coat! Also glad about the whole sleeping thing, deadlines wreak havoc with my sleeping pattern too, so I can understand. I haven't left the house for two days, the snow is awful! this is one of my favs. i never would have thought of buying a cheap ribbon and adding it to a shirt! guess it shows how uncreative i am hah. the blue looks really good with the coat too. I am loving shirts and blouses at the moment. Seems to be all I'm wearing. 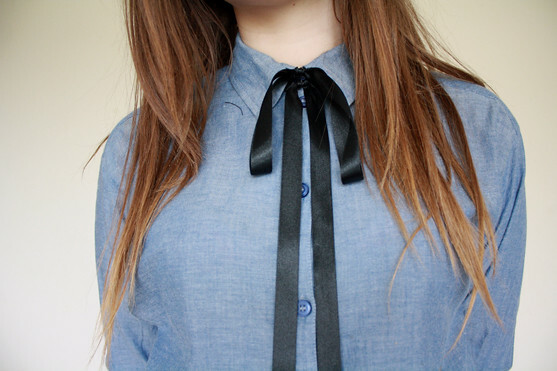 i LOVE this blouse and ribbon look, it's so cute. i can never pull this off, it just looks either victorian-boy or too-high-neck on me. looks great on you though. I love the new ribbon idea, Lily. It is really good and you really suit it! aaww I really love this outfit! That blouse looks so good, and the ribbon idea, you always inspire me, Lily! I feel your pain with the sleeping thing- its taken two duvets and two sheets to finally give me a solid night's sleep; i don't deal with the cold well at all! oh gosh, i think this is my favourite outfit ive ever seen on you. you look awesome! i adore a buttoned up shirt tucked in and you look positivley delightful. bows on shirts are pretty much a favourite. your outfits are always so well put-together. loving the shirt and the coat! whats ur shoes when u weare this coat? Your blog is quite new to me but it's fair to say that you inspire me each time I visit. I love that your looks are stylish but still wearable, I mean like spending the whole day wearing them! That's what I love about you and of course, your honest writing style! I absolutely adore what you are wearing, i might just have to try that out !! There's a total menswear vibe coming from this! I dig it! LOVE the coat. I was eyeing a similar one in Topshop but I don't think my wallet likes it as much as I do. Gah. Would love for you to enter my Christmas Giveaway! great outfit. and i love the photos. Thats a beautiful shirt! I love shirts/blouses so I may just have to pick it up. Am also LMAO at Morven's sleeping tips!! Hello from Mallorca! We love the look, the shirt is lovely, gives a very elegant touch with the loop. We've translated into English but do not know if it will be well, forgive the bugs! The shirt looks really good on you, very Alexa! I'm sure I saw Carrie create a bow tie similar to this a while back? i find all of your outfits so inspiring and your you tube is great. wish i had a job too. hope your sleep returns to normal soon. oooh I never thought of makeshifting a necktie like this, Ive wanted one for ages. Thanks for the inspo. This looks unbelievebly cute on you! Lovely lily! Great outfit, love the bow tie. great idea for the tie! I have that leopard print coat from New Look and love it, so nice. your so lucky with your style, everything suits you; very versatile! I love the ribbon tie. I think you look great in a button down shirt! This look is great. Its classic but because of the fabrics also sporty! I hate that its summer in New Zealand.You make me wanna get out my tights skirts and shirts again! i guess ill just have to put up with floaty lacy summer frocks. I want to go back to europe for a real white christmas (and admittedly high street shops, the ones here just dont cut it! Cant wait till the next post! yay, Marina and the Diamonds. :) I saw her live and she was fantastic, she's got a great voice. love the shirt, it totally suits you! The ribbon's such a good idea! I never ever thought to just go and buy some - it's so obvious, how come I never thought?! Now that you've alerted me to my own stupidity I think I might go out and get some for my shirts tomorrow! This is so cute and that little bow just makes that shirt perfect!! I like how you make this shirt work! Lovely! Can you please make a 'what's inside my bag ' ? i love this look, the shirt looks great on you! i also wear a ribbon like that lately, simple & cute. i'm still so proud to be featured in your last post, thank you for that! love this look. you are so amazing! You look lovely, as per! I have that coat from New Look but this sizing is ridic for some reason; I'd say I'm a size 12 but I bought a size 18 in the fur coat! xo. The ribbon is great. Not so long ago I used one too [here]. Mine is a belt from a blouse I have. The firt time I saw it I got me thinking in other ways do re-used it :D Loved it. 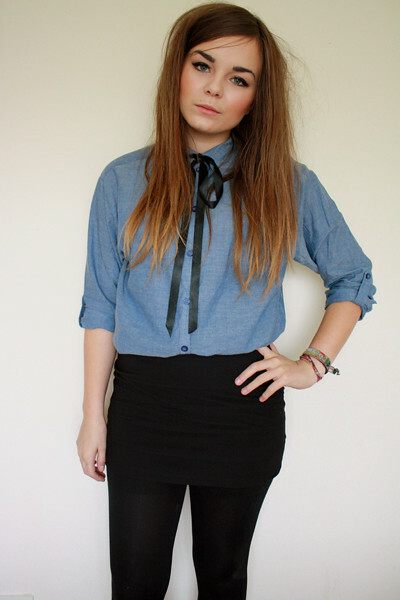 i love the look of the chambray shirt! button down shirt are my fave...i wear them probably 3 times a week :) hope your sleeping troubles go away and you can get a good nights rest! Aw haha thats so funny how people wouldn't automatically think that you'd wear a coat out! i like your blog very much but im sure you know your blog is beautiful.